This article is about the city in Henan. For the village in Liaoning, see Pingdingshan (village). 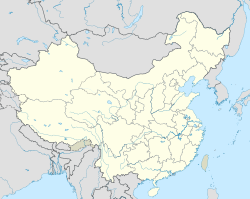 Pingdingshan (simplified Chinese: 平顶山; traditional Chinese: 平頂山; pinyin: Píngdǐngshān), also known as the Eagle City, had 4,904,701 inhabitants at the 2010 census whom 1,756,333 lived in the built-up or metropolitan area including Ye county. It is a prefecture-level city in central Henan province, China. Pingdingshan borders the provincial capital of Zhengzhou to the north, Xuchang and Luohe to the east, Zhumadian to the southeast, Nanyang to the south, and Luoyang to the west. Pingdingshan was founded in 1957. In Chinese, Pingdingshan means “mountain with a flat top”. The city is named after a nearby plateau, the top of which is very flat. The reason for the nickname of the city "Eagle City" can be traced back to two thousand years ago during the "Spring and Autumn Annals". There was a small country royal named Ying who lived in Pingdingshan area. In ancient times, the word "Ying" had the same pronunciation as Eagle in Chinese, therefore people also called Pingdingshan "Eagle City". From 2003.08 to 2005.04 Wang Zhaoping was the Mayor of Pingdingshan. From 2005.04 to 2008.03 Zhao Qinglin was the Mayor of Pingdingshan. From 2008.03 to 2010.10 Li Endong was the Mayor of Pingdingshan. From 2010.10 to 2013.04 Chen Jiansheng was the Mayor of Pingdingshan. From 2013.04 to now Zhang Guowei was the Mayor of Pingdingshan. The prefecture-level city of Pingdingshan administers 4 districts, 2 county-level cities and 4 counties. Mineral Resources: Pingdingshan has extensive mineral resources such as coal, manganese, salt, iron, aluminum, fluorite, gypsum, etc. 10.3 billion tons of coal reserves, the largest coalfield area in the South and East of China; well known as "the coal storage of the central area of China". 230 billion tons of salt reserves, ranking first in Henan Province, second in China. Pindingshan is very rich in water resources compared to other inland cities. It has Baiguishan Reservoir, Zhaopingtai Reservoir, Yanshan Reservoir, Shimantan Reservoir and Gushitan Reservoir. Pingdingshan has been identified by the Economist Intelligence Unit in the November 2010 Access China White Paper as a member of the CHAMPS (Chongqing, Hefei, Anshan, Maanshan, Pingdingshan and Shenyang), an economic profile of the top 20 emerging cities in China. Pingdingshan thrush Valley A National "AAA" rated scenic spot and a major tourist attraction in Henan. It is named after the many thrushes breeding here. The scenic area is a total of 30 square kilometres (12 sq mi). There are numerous attractions such as cuckoo lake, an area known as "the pocket of the Three Gorges". Yaoshan A national "AAAA" rated scenic spot. Located nearby in Lushan County. Originally known as Yaoshan Shirenshan. Home to the Spring Temple Buddha, the largest statue in the world, built in 2002. ^ "China: Administrative Division of Hénán / 河南省". Retrieved 28 May 2015. ^ "河南城建学院". Retrieved 28 May 2015. ^ "Sister city relationship Syzran" (in Russian). Archived from the original on 2010-09-25. ^ Grayling. "THE RISE OF THE 'CHAMPS' - NEW REPORT MAPS BUSINESS OPPORTUNITY IN CHINA'S FASTEST GROWING CITIES". SourceWire. Retrieved 28 May 2015. Wikivoyage has a travel guide for Pingdingshan.